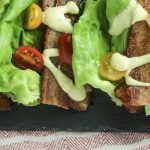 This Keto Cuban sandwich Recipe makes a delicious low carb sandwich option. 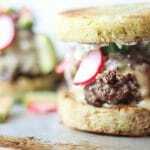 Filled with ham, pork, Swiss cheese and mustard, it’ll satisfy your cravings and still be keto friendly. It is starting to feel like Summer in these parts! It’ll be 90 degrees this weekend and here’s hoping my vegetables will stay happy and content in this weather. The last couple of months haven’t exactly been easy, with Albus having major spinal surgery for IVDD in April and then the aftercare and physical therapy. He is still not walking which does make me things difficult but we are hopeful and encouraged by the progress he has made so far and I’m finally feeling like things are getting back to normal. But you’re here for the food, so let’s talk about this Cuban sandwich. 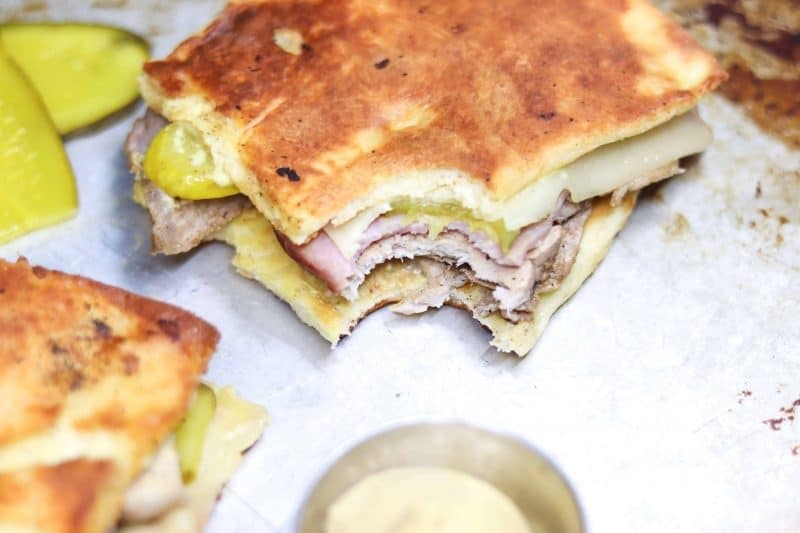 A lot carb, Keto Cuban sandwich to be precise. Is it possible? Is it real? It is indeed, my friends. 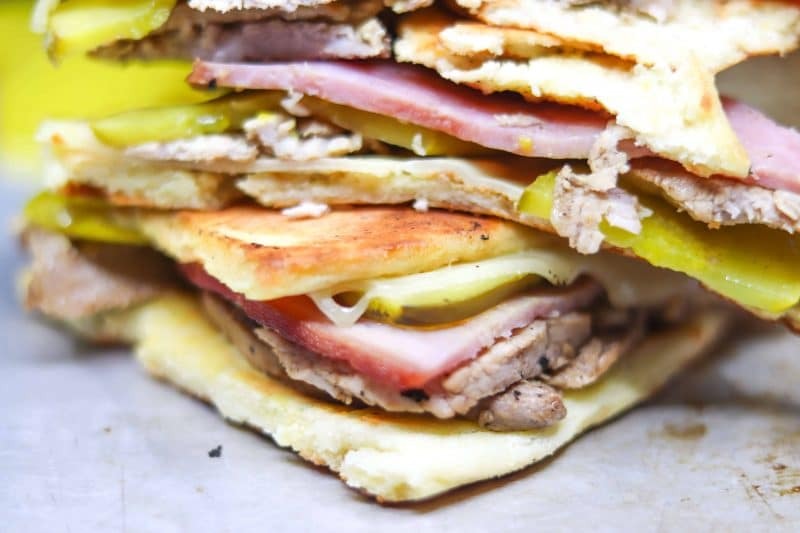 Obviously, it’s not on traditional bread (aka low carb/keto) but this sandwich has all of the flavor profiles of a traditional Cuban sandwich and totally satisfies my craving for one all the while staying low carb and keto. I pretty much need to eat this sandwich or some type of grilled cheese every time I watch the movie Chef. It’s easily one of my favorite movies, so feel good and of course the food looks delicious. 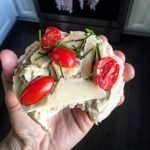 So I came up with a way to make this and as lately I eat mostly low carb and keto foods, I decided to make it that way too! 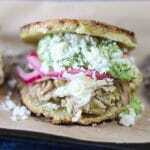 Typically, a Cuban sandwich is made with pork shoulder. However, sometimes if I’m a little more pressed for time, I will just use a thin pork chop or something similar. TBH this is way easier than making your own lechon (pork). But TBH again making your own lechon is going to be 100% more delicious. 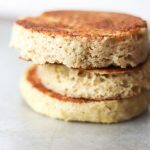 Sometimes I do that when I feel like spending more time cooking and want the real deal but for weeknights when I’m trying to get something delicious on the table, this works just fine for me (your mileage may vary). In here, I’m just using a thinly sliced pork chop that I marinated and seasoned but definitely feel free to switch this up with lechon if you can! I’m using slices of ham from a roasted ham but you could also use deli ham. I like the thicker slices of ham but it can be easier/quicker to use deli ham sometimes. Make it work for you and your time. 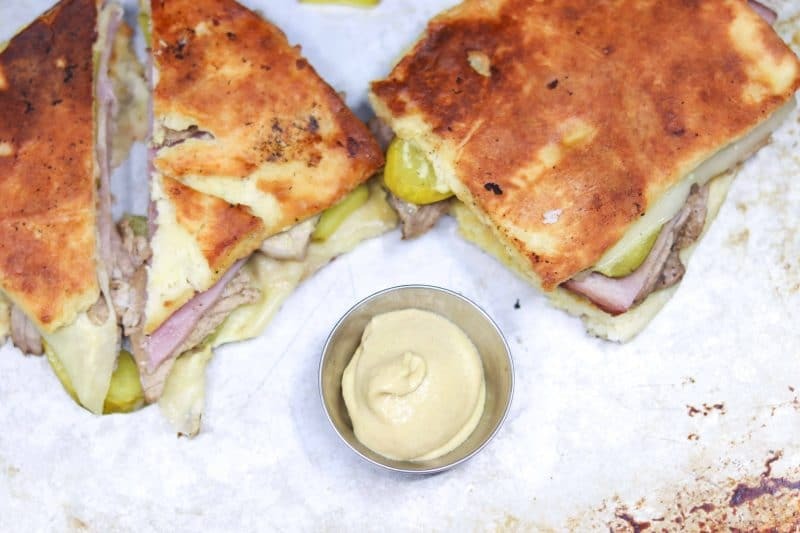 This Keto Cuban sandwich Recipe makes a delicious low carb sandwich option. 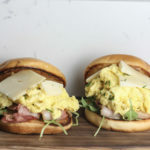 Filled with ham, pork, Swiss cheese and mustard, it'll satisfy your cravings and still be keto friendly. Add mozzarella and cream cheese to a bowl and microwave for one minute. Take out and stir well, then put back in the microwave for another minute. Mix to combine well. Add egg to mozzarella and cream cheese mixture and mix well. Then add in the almond flour and baking powder and combine well again. (The dough will be wet but if it is too wet that you can't get it to stop sticking to your fingers then add a little more almond flour). Roll the dough flat with a rolling pin or with a piece of plastic wrap on top and use a wine bottle. Once you've rolled it flat, about ¼" thick, shape into "bread" shaped pieces. I made squares but you could also do circles, rectangles, etc. Lay on a lightly greased cooking sheet, parchment paper or a silicone baking mat. Bake at 425 for 12-15 minutes until golden brown. In a bag or bowl big enough for the pork, mix together olive oil, orange juice, oregano and garlic. Add pork and let marinate for at least 30 minutes. To cook, heat olive oil in a pan, add in pork and cook until cooked through. Time will vary depending on the thickness of your pork. Once cooked, thinly slice pork. Spread mustard on bread then layer on ham, pork, pickles and Swiss cheese. Add to a pan and put another pan on top, weighed down so the sandwich will flatten. Once the cheese has melted, take sandwich out.